There is always much discussion, even within the gun community, about whether or not certain types of workers should be allowed to carry defensive firearms while working without special training. It is the position of the Second Amendment Organization that this is a very simple Right to Carry issue. A person who can legally carry a gun should be allowed to carry at work. There should not be special training requirements for teachers, firefighters, surgeons or any other class of worker who is simply carrying their firearm for personal defense while performing their duties. A teacher who choses to carry a concealed firearm does not become a security guard. A paramedic who carries a defensive firearms does not become a police officer. To suggest that certain classes of people should be required to get special training to exercise their Second Amendment Rights, or to suggest that certain workplaces should require special training, is antithetical to the pure concept of the Right to Keep and Bear Arms. We support “constitutional carry” and the responsibility to train and carry safely being an integral part of firearms ownership and the gun owning community. We do not support mandatory training for purchase, possession of carrying of defensive guns. A few years ago, I was invited to speak at a national conference of Fire and EMS agency leaders and trainers on the topic of the responsibility that their agencies had to allow their first responders to be prepared to defend themselves from personal attack while working. This is a very contentious issue in some circles, but none of the objections that I have heard trump the individual right to self-defense and the role that the right to carry a defensive firearm can play. 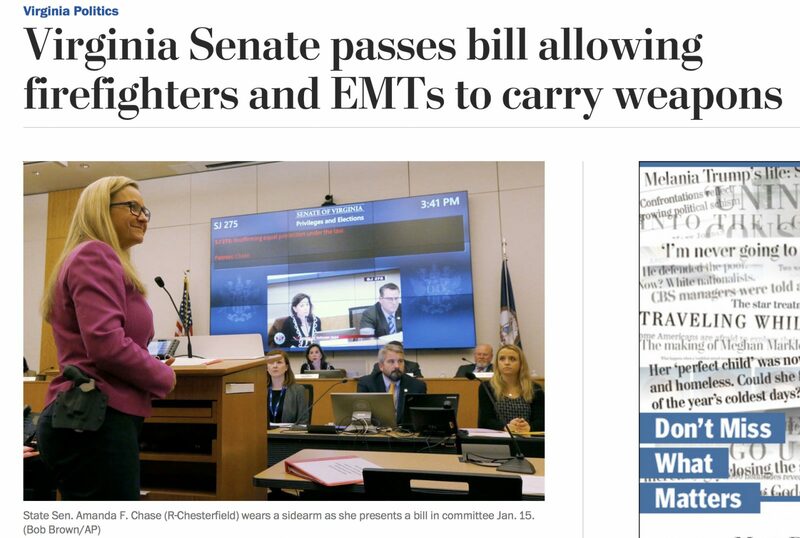 I applaud the Virginia Senate for passing this Bill, as it is a step in the right direction.